The specks appear in different stainless steel bowls ("Stainless steel" imprinted on all bowls - no aluminium or other metals involved as far as we can tell). 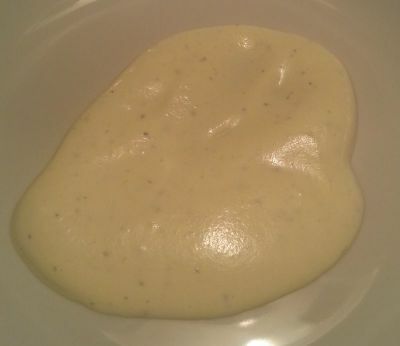 The same whisk used in a plastic bowl does not produce specks. The cream is organic, 40% fat (Swedish "Arla EKO"). We cannot detect any strange taste. It seems probable that the specks come from mechanical wear. But what is it? What could be the cause? Is there something we should know about Stainless steel bowls? Those look like air pockets - you're using an unusual whisk, perhaps it can't get enough "bite" on the stainless steel bowl to pop them, whereas the plastic bowl's texture offers enough resistance. I'd try it with a balloon whisk rather than a spiral whisk, and see if that helps. Here's a breakdown on whisks and their uses from Craftsy. We just experienced the same phenomenon, and we were able to confirm that the specks were NOT bubbles - if we were careful enough, we could isolate the flecks. They came in different shapes - some were specks, but some were almost filaments. We have a stainless steel bowl, but we suspect the whisk was aluminum. Since aluminum is Mohs hardness 2-2.9 and stainless steel is 5.5-6.3, it's quite likely that the aluminum whisk was leaving residue on the side of the bowl that was ending up in the whipped cream. We are avoiding aluminum utensils anyway, so now we will purchase a stainless steel whisk and see if the flecks still occur. 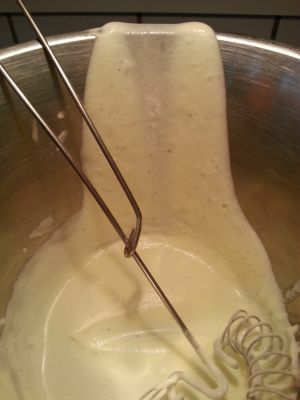 We've upgraded the whisk to stainless steel, and it still occurs when whipping cream in the stainless steel bowl. I think the way to avoid flecks is to not use metal with metal, but instead use the whisk in a bamboo/plastic bowl. Not the answer you're looking for? Browse other questions tagged food-safety chemistry whipped-cream stainless-steel or ask your own question. Are stainless steel frypans oven safe? Dark grey residue from newly purchased stainless steel kitchen items?